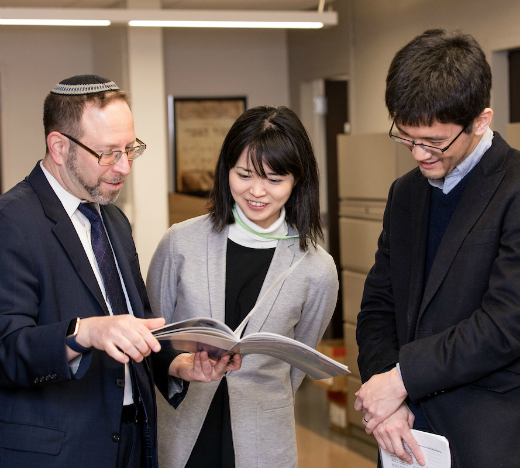 On March 22, two Japanese scholars of Judaic studies visited with faculty at Yeshiva University’s Bernard Revel Graduate School of Jewish Studies to discuss their research and the state of Jewish studies in Japan. The scholars–Dr. Masahiro Shida and Mina Lee–originally met with Dr. Mordechai Cohen, associate dean of Revel, at the World Congress of Jewish Studies in Jerusalem last summer. “The visit of these scholars to YU attests to the global reputation of YU as a center for academic Judaic studies in a variety of fields,” said Dr. Cohen. Dr. Shida’s research focuses on the Ramban, while Lee’s work explores the Jewish community of Venice in the 17th century. The two will also accompany Dr. Cohen at the World Congress of Philosophy in Beijing this summer, where they will deliver academic lectures in their fields of specialization. Instrumental in organizing that conference is Dr. Youde Fu, founder and director of The Center for Judaic and Inter-Religious Studies in China. Dr. Cohen regularly delivers lectures to Dr. Fu’s students in Shandong University, and as a result, Dr. Fu asked him to invite Judaic studies scholars from other countries to lecture at the World Congress of Philosophy. In addition, based on Dr. Cohen’s recommendation, Lee will also deliver a lecture at the Shandong Center this May on the Jewish ghetto of Venice and its importance for Italian Jewish identity. “It is particularly gratifying, as a YU professor, to be able to facilitate a link between Jewish studies scholars in faraway lands. 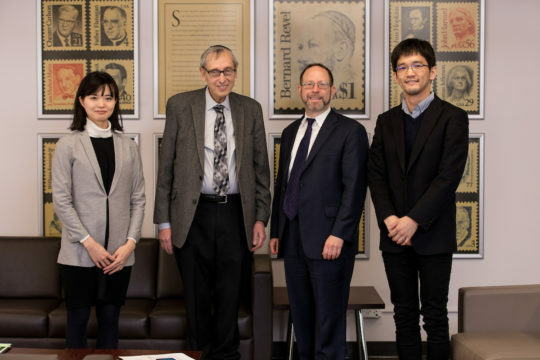 These young Japanese scholars met me in Jerusalem and visited us at YU, and as a result are forging ties with the growing community of academic Jewish learning in China,” Dr. Cohen said.